Mary writes to Martha that she has not forgotten the day she spent with Martha and the promise she would come to Greenwich and speak of her work. She asks that Martha inform her of the earliest possible date and time that would suit to visit Greenwich when she comes north in December. 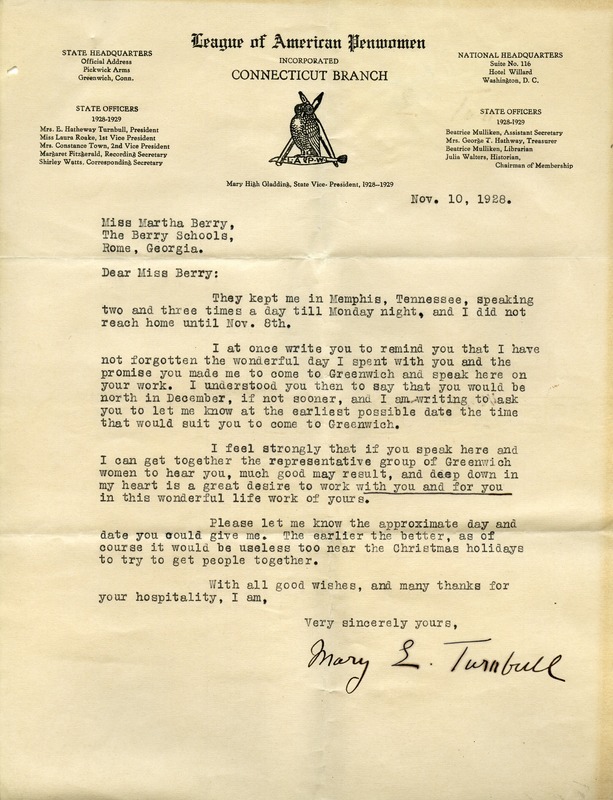 Mrs. Mary Turnbull, “Letter to Martha Berry from Mary Turnbull.” Martha Berry Digital Archive. Eds. Schlitz, Stephanie A., Aaron Jackson, et al. Mount Berry: Berry College, 2012. accessed April 25, 2019, https://mbda.berry.edu/items/show/9158.